The idea of an online private sale is simple. Generally high-end items are offered to a select group of shoppers at a reduced price. These are typically temporary deals reserved for people who have previously registered on the site. There are already quite a few private sale sites on the Internet, and even traditional stores are offering regular private sales as a way to complement their basic catalogs. So what are the advantages of private sales, and are they a good idea for you and your online business? Before diving into private sales, let’s take a closer look at the market. Private sales often offer major brand-name items at lower prices than usual. After all, this is the point of a private sale – to offer unbeatable prices to a select few shoppers. But that’s not the only advantage, the private aspect of these sales gives customers a feeling of privilege, of membership in a secret club. Entry into private sales often requires sponsorship, and customers must have an account in their name. Structuring private sales in this fashion makes consumers feel singled out for special attention, and not just part of the masses. Stock during private sales are typically limited. And while merchants offer rock-bottom prices, only a privileged few can benefit from Private sales. For you e-tailers, there are loads of advantages to opening a private sales store! First off, private sales sites offer a practical way to sell unsold stock from previous collections. Private sales also help you can increase your client base, and the sponsorship system can potentially double your customer accounts. The viral marketing that comes from any private sale works well and is highly cost effective. The precise sale hours mean that your site traffic will go up, so make the most of the opportunity and put your other promotions front and center! It all started two years ago, when two experts met each other – one from the world of sports, the other from the world of private sales. Online since March of 2010, the site has already proved to be a success. Privatesportshop brought in $9 million in sales in 2012, they have 1 million members and process nearly 25,000 orders a day. How can you follow their path of success? You need to examine two key issues in order to make your private sale go with a bang. The first is marketing. "Focus on acquiring new members, and transforming them into buyers," said Mr. Durand, the brand’s co-founder. The second issue is products. "Work on your sourcing before anything else, it’s important to establish long-term relationships with your partners." 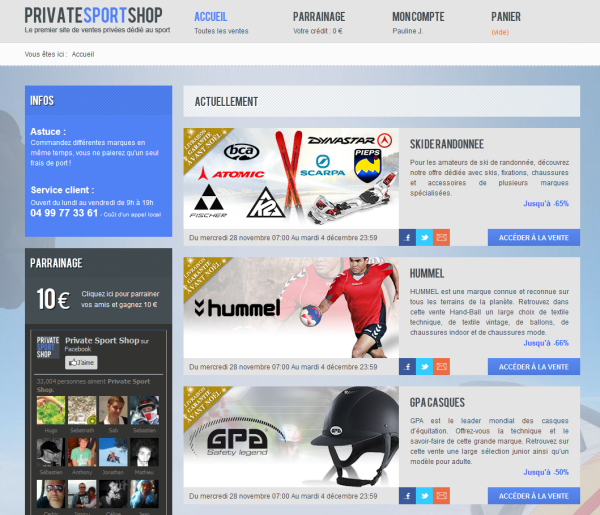 Because of their hard work here, Privatesportshop now has more than 500. Choosing the right products is central to the process. "It’s crucial to offer a good product at a fair price." Don’t forget to check out what your competition is up to and ‘take the temperature’ of the market. Distribution too plays an important role in the process. Unlike a ‘traditional’ site, there’s no stock left hanging around, you just need to have it on hand for a few days. "Don’t make the mistake of rushing through the distribution set up; it needs all your attention. Our stock lasts seven days, based on two to three sales every two days." With PrestaShop you can open your own online private sales store. "Thanks to the flexibility of PrestaShop, we were able to to configure our site easily," says Mr. Durand.